Have you ever felt frustrated because you couldn’t find a file or photo you need only to discover that you’ve deleted it by accident or it got lost when the drive got corrupted? Well, don’t start kicking and screaming – what you need is a reliable data recovery app. Cisdem DataRecovery for Mac is a good choice. 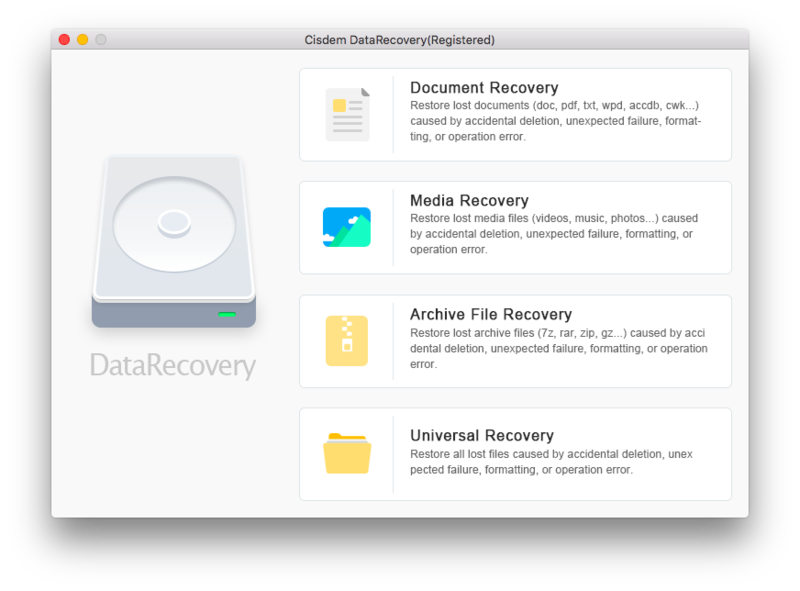 Cisdem DataRecovery is a solid Mac data recovery app that can recovery files in pretty much all formats (the list is really vast) from all sorts of drives. It has an intuitive interface that looks very Mac-like. This Mac data recovery app has all the features for successful file and photo recovery. The first thing that attracted my attention is the vast number of formats Cisdem DataRecovery supports. The list is huge for all types of files (images, videos, audio, documents, etc.). I even had to use the “Unselect All” feature to select the formats I wanted to scan for because unchecking formats one by one took a ridiculous amount of time! Another great feature of this app is its ability to recover files from pretty much all types of drives and devices. As long as your Mac assigns a drive letter to a device when you connect it, Cisdem can restore files from it. Cisdem DataRecovery finds pretty much every deleted file on your drive. So, when you’re recovering files, make sure to use the Preview feature because some files can only be recovered in part. You should also take advantage of scan results filtering options and sort the results by files size or file name. What I missed was a feature that would allow preventing Cisdem DataRecovery from scanning for all recoverable files. It would be nice to have a file size filter option before the scan, so that one could tell Cisdem to not look for files smaller than, say, 1Mb. That would make the scan faster and save your time because you won’t have to go through all those browser cache files that got recovered. Cisdem DataRecovery really does its job well and finds lots of files that can be recovered. The only downside is that the scan takes a long time, especially if you have a large drive. This Mac data recovery app is incredibly easy to use thanks to its well-thought-out interface that looks so native on a Mac. You won’t have a problem figuring out how to use it and if you have, navigate to the menu and read the Help file. Cisdem DataRecovery for Mac is a powerful file recovery app that will help you undelete lost files with ease. It could do with more options, but it does a good job overall.